Drag racing is a large part of the Moser family and Moser Engineering company’s history. Justen Moser added to that legacy in June when he became a third-generation International Hot Rod Association winner at the Summit Sportsman National Championship race at US 131 Motorsports Park in Martin, Michigan. His win in the Super Rod division came at the same track where his father, Rob, won his first IHRA race. Justen races a 2010 Corvette roadster that his father and Tim Irwin built. His father raced it the first four years before turning over the car to Justen, who finished third in his division last year and won his second year. Of course, the car has all of the best products from Moser Engineering. The Portland, Ind., company’s roots are in racing, founded in 1982 when Justen’s grandfather, Greg, resplined a pair of axles and shortened a 1957 Oldsmobile rear for his own race car. Some 35 years later, Justen Moser put the company’s parts to the test with a final-round run that featured him rocketing down the track in 9.913 seconds at 170.91 mph. It also featured a near perfect start by the driver with a .002 reaction time. It allowed him to experience his favorite part of drag racing. Besides highlighting the Moser Engineering products, the sport has allowed him and others to build relationships with Sportsman racers and the Street Car enthusiasts who often attend the events. For Justen, there are common traits with driving a race car and his full-time job as purchasing manager for the shop. Both require a high attention to detail with his position requiring him to take inventory on roughly 10,000 parts to keep production going and to have parts for customers to purchase. Through it all, the company and the sport continue to be intertwined. Moser Engineering is an IHRA contingency sponsor and beyond the Indiana-based team, it also sponsors race teams in Louisiana, North Carolina and on the West Coast. But for a driver named Moser, it’s an extra special feeling when he straps inside the cockpit of his Super Rod machine carrying the company’s decals. He competes with other drag racing organizations, but is quick to point out how the IHRA Summit Sportsman National Championship format is his favorite. 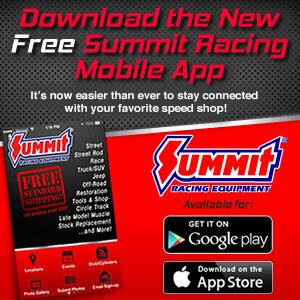 He likes how it’s a program designed to create great value for the Sportsman, grassroots racer.